Many remote communities around the world are dependent on diesel generators for their energy requirements. Diesel generators are also a major source of backup power in many developing countries experiencing frequent power cuts and power reliability concerns. In the past decade, diesel prices have more than doubled. High fuel costs have translated into tremendous increases in the cost of energy generation. Diesel generators are also a major source of pollution. Solar and wind power technologies are clean, affordable, readily available, sustainable and can replace or supplement generators in both residential and commercial applications. 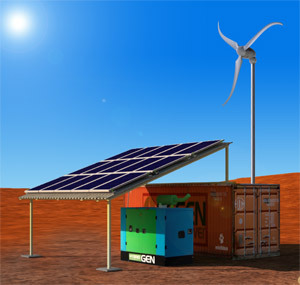 Hybrid energy systems integrate these renewable energy technologies with diesel generators with or without battery storage to provide grid quality power in remote areas not connected to a utility grid. 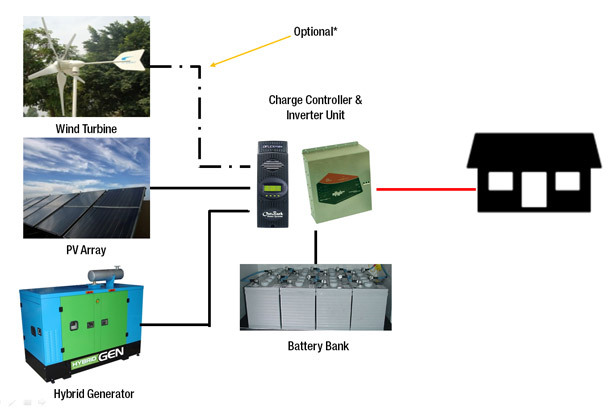 Regen Power provides a state of the art Hybrid Renewable Energy System (HyREPS) that hybridises a number of key Renewable Energy Resources such as Solar PV, CSP technology, Wind Turbines, Biomass etc depending on resource availability with our award winning HybridGEN technology to provide a reliable remote power generation solution that operates at a fraction of the traditional diesel generator costs. This solution is very suitable for powering remote mobile telecommunication towers, mining camps & operations, resorts , island communities, farms and other remote power applications. Other options available. Please contact us for more details.